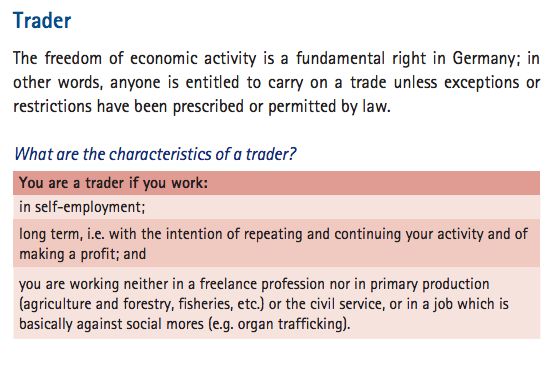 The German tax system can be summed up as complicated, especially for a freelancer trying to find your feet. I’ve been a freelancer in Berlin for 20 months already and I’ve had my fair share of expensive conversations with accountants and scary-looking letters from tax authorities. In this post, I wish to give a simple overview of what freelancers in Germany can expect. As a disclaimer, I’m not a professional accountant or financial advisor so see this post as just a general guideline. Before you even start taking on jobs, you first need to have the appropriate documents; starting with the correct resident visa. Here’s something I wrote previously on how to get a freelance visa. Once you have the correct visa in your passport, it’s time to make a trip to your local Finanzamt and apply for a tax number (Steuernummer) that will allow you to work as a freelancer (Freiberufler). You don’t need to make an appointment and the wait time isn’t so long. Once you’ve submitted your form, it can take up to four weeks or even longer to receive your tax number by postal mail. During this time, you can work but you’re not allowed to invoice your client and get paid as your invoice is incomplete without the tax number. It took me more than two months to receive my Steuernummer and thankfully I had some savings set aside to get me through the three months of not being paid. As a freelancer, it means you have different clients over different periods. When you start only working for just one client over a duration of a year, you are not considered a freelancer and might even get fined. I’ve seen posts saying that you need to make sure that 80% of your income can’t just come from one client. I’m not sure if this is accurate but key point is not work for one client over a long period. I’m a marketing consultant and was accused by the Finanzamt that I’m a trader and had to submit my resume and portfolio. I haven’t heard back from them since so perhaps that’s resolved. A direct translation of Kleinunternehmer is simply a “small entrepreneur.” It means you don’t make more than 17,500 Euros (gross) in one year and don’t intend to exceed 50,000 Euros in the following year. The advantage of being a Kleinunternehmer is that you don’t have to register for VAT (Mehrwertsteuer aka MwST). As soon as you go over 17,500 Euros, you must start charging VAT immediately or the start of the next calendar year. Let’s say you reached 30,000 Euros in October 2014, you are no longer considered as a Kleinunternehmer. On January 1st 2015, you must start charing your clients VAT. Before you can charge for VAT, you will need a VAT number which is separate to your Steuernummer. You can apply for a VAT number online and within a week or so, you will receive the number in your postal mail. Charging VAT to your clients means adding 19% MwST to your net invoice charge (the percentage varies for different industries such as farming and publishing). Let’s say you charge 100 Euros for your service, you will need to add 19% to calculate the gross amount (which comes to 119 Euros). The only time you don’t need to charge VAT is when a client is based overseas and has a VAT number. The VAT isn’t yours to keep but will need to be ‘returned’ to the government on a monthly, quarterly and sometimes yearly basis (this depends on your status and whether or not an accountant is doing this for you). Charging VAT means more paperwork, but it also means that you can get VAT refunds immediately on business-related purchases. Which essentially means you will receive a 19% discount on items and services like a mobile phone, computer, conferences, books and even soap and glassware — as long as you can prove that they’re related to your business. I was a bit hesitant to charge VAT as I wasn’t sure if raising my rates by 19% was going to deter clients. The thing is, as long as your clients have clients themselves or they’re an established company, they will get back the VAT you charged. So charge away and don’t feel guilty or deflated about this. It should be the least of your tax concerns. A lot of freelancers run into the problem of spending money that isn’t theirs. As a freelancer, you’re subjected to paying income tax, whether you’re a Kleinunternehmer or not. When you’re a regular permanent employee, your employer will deduct your income tax from your monthly salary. As a freelancer, you need to be setting that income tax money aside and not even touch it. If I was expecting to receive 30,000 Euros for the year, I would probably be charged around 20% of income tax. Which essentially means that every month, I will need to set aside at least 20% as I will owe this to the government when I complete my annual tax statement. Essentially it means that the VAT I’m paying (29.95 Euros) will need to be handed over. 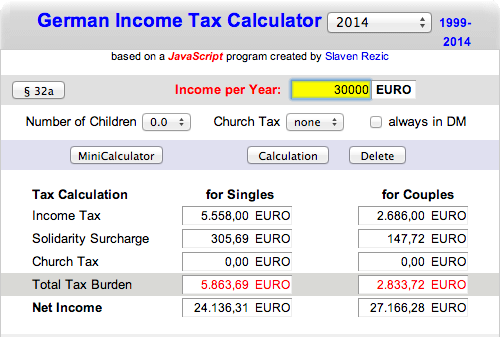 And if I’ve calculated that 20% of my income will be taxed, I should also set aside around 32 Euros (157.65*0.20). It’s worth setting up a savings account just so you don’t touch the money and accidentally spend it. Business-related items will reduce the amount of VAT you need to hand over and also lower your income tax (as income is calculated as revenue minus expenses). To get the most out of your tax deductibles, hire an accountant to do the work for you. It doesn’t hurt to submit receipts and your accounting and the the tax office will decide whether it’s legit or not. Also make sure that you keep ALL your invoices for at least seven years as during this time, you can get audited and will need to produce paper receipts. Although this document is for people looking to set up a company in Germany, it certainly provides some great insights for freelancers as well. The document is in English and produced by IHK Berlin. Download link here. I’ve probably visited five different accountants and really enjoyed working with Benjamin. He speaks English, knows international taxation (great if you’re an expat), friendly and super helpful. He’s actually funny, which is a good change from the usual dry, awkward humour of some German accountants. You can e-mail him: benjamin.gruschla [at] spezialisten.de. I want to ask about VAT. actually I was charging VAT for my clients for about 6 months until I realized that I prolly will not make 17500 by end of the year. Any suggestion for my case? should I return back the vat before tax declaration? All you need to do is fill and submit that form, and you will receive your tax number a few weeks later. How to get the VAT number online please? Hi thanks for all the info, where can I apply for the German VAT ID online please? and how do i prove 17.5k annually in a bank account without having official documents ? What is the range price for accounting consultancy/legal advice in berlin? You’re looking at anywhere from 25-100 Euros per hour depending on what you need and how skilled the person is. Hi Yi, would you be able to direct me to an English speaking Tax Consultant in Berlin? I will soon be moving to germany from the US. I am an American citizen and my wife is a german citizen. She will be working full-time and already had a job lined up. I have a job here in the US (which I will obviously be quitting) but currently also do freelancing on the side. I plan to retain my clients here in the US and also pick up more in Germany. Can you explain how my taxes would work from US based clients, as well as the best way to receive payment from them? I currently have a business account in the US and my thinking is to keep it open and continue deposits there. I think that’s enough to bombard you with for now 🙂 I’m truly grateful for your response. Good advice but don’t forget about healthcare and pension they can be a killer on a low income! Health care right! So expensive as a freelancer………. I just want to know where can i fill a VAT number at? Is there a website link and how long does it take to recieve a VAT number? Hi Yi, thanks for the information. I went to the Govt office today and it was strange since they wrote on my temporary visa (Consultant) and stamped on it. I guess it means i can start working until they call me back for the alien id card which i am suppose to recieve with my new visa. I was just wondering if i can invoice my current client for 5 days of work, with a higher amount than whats written in my contract. Thing is, there is quite a lot of work which i plan to charge extra. Will this be alright, or will this create a problem? My client does not have a problem paying me extra for the hours im giving in starting today for the next 5 days. Thanks for your insightful blog post Yi! Hi Yi. Carlos here. Question! Is Benjamin on vacation or something? I have tried to contact him via email for the last 3 weeks and called his office and nothing. Is he on vacation? and if so do you know when he will be back? thank you for your answer, I still have one more questions? When should I start to start to pay tax? For example, if I get my visa in December, 2014, and went to finanz amt in January, 2015. When should I start to pay tax when I do tax declaration in 2015? From January ,2015? When you have the proper visa and also the Steuernummer, you can start invoicing and essentially start paying income taxes. In Germany, the Fiscal year is end of December, and you usually have around 4 months to report your income, or around a year if you do it through an accountant. You will most likely start reporting your income in 2016 for the money you’ve earned in 2015. Thank you for your great tips, it is super helpful! I have 2 questions would like to ask you! 1. Kleinunternehemen can not make money higher than 30000Euro or 17600 Euro? 2. I already have Tax number, because I used to work in German company, and then I decided to switch to freelancer, and trying to get my freelancer visa, do I need to apply for another tax number after receiving my freelancer visa? Thanks! Look forward to your reply! Kleinunternehmen can’t make more than 17,500 Euros per month. If you do go over, the following year you must register for a VAT. The tax number you have with your former employer is different to a tax number you need to freelance. You will probably need to go to the Finanzamt to apply for a freelance tax number. Hi! Thanks very much fore this article. I’ve been through a lot of articles trying to understand better all the bureaucracy of freelancing, and I still have some doubts unclear. Do you think you can help me with some of them? – as a freelancer, should I charge the 19$ VAT even when the client is abroad, like Brazil or Russia for example? – the Total Tax Burden is paid once a year or there are some taxes you should pay monthly? – when you say about seting money, you mean that every month you set 20-30% of your monthly income to pay it back to govern in the end of the year? – when doing freelance to clients abroad, do you many taxes to receive the money that is coming from outside Germany? – as freelancer, which health insurance do you have: public or private? Can a freelancer choose between these two options regardless the income? Tks! And sorry for so many questions in a row! – When you’re a freelancer and don’t earn more than a certain amount, you don’t require to charge VAT. If you are charging VAT but your client is not based in Germany, then you don’t need to charge the VAT. In some cases, you do need your client’s VAT number to put on your invoice. – So there are two types of taxes you need to be aware of. The first one is VAT, which can be paid monthly or quarterly. The other is income tax, which can also be paid quarterly or you can choose yearly. – You can choose either health insurance, as long as you’re adequately covered in Germany. Hello Yi, I emailed Ben but didn’t get a answer back. Is he on vacation or something? I only needed to save in the first year, the following year the Finanzamt estimated my earnings and billed me quarterly for income tax based on my previous year’s earnings. My accountant then did my taxes at the end of the year and got me a refund from that. Christa Bahr in Neukoelln, Karl Marx Platz. Not much English, but knows her stuff. Thanks for sharing this info Paul! Hello! I have a quick question. With this quarterly tax estimation, what if you do not make any money in that quarter? Do you still have to pay all the tax they estimated? How could you pay if you make no money? Usually income tax is calculated based on your ANNUAL salary. I’m not sure how quarterly reporting works for income tax as I calculate and pay mine at the end of fiscal year. For the quarterly tax payment, this is for VAT. Meaning if you didn’t make any money that quarter, then you won’t need to pay VAT. Thank you for the information. I have been searching every where for freelance info in regards to tax amt. I am trying to find out how much I need to charge but of course I need to know how much taxes I need to pay. But how do you know how much you are going to make in a year. You really don’t know how the business is going to go. Do you need to fill out paper work for Kleinunternehmer or Freiberufler? or both? Additionally, is it expensive to have an accountant? When you start freelancing or start your own company, it’s best to do a financial forecast. Of course, it’s always hard to determine how much you’re going to make, but a rule of thumb is to set aside 30-35% for income tax. VAT should go onto of what you charge and income tax, so this should be quite consistent as it’s a 19% flat-rate. Which paperwork are you referring to? For income tax, this applies to everyone. For VAT, it’s separate to your income tax. If you qualify for a Kleinunternehmer, you don’t need to opt in to pay VAT. A good rule of how much accountants: Usually 3-4% of your gross salary on a month-to-month basis (excluding VAT). If you make 2,000 Euros per month, you can expect to pay around 60 Euros a month for bookkeeping. Of course, this is just a rough figure. Before starting, it never hurts to go see an account for an initial consultation (usually free). I would highly recommend my accountant Benjamin (contact in the blog post). Yi, thanks for the reply back. I think I create some confusion with my questions. What I was asking, as a freelancer do you have a application you need to fill out as a freelancer at the tax office? Or do you have to fill out more paper work like Kleinunternehmer. Also, what is the frequency that you have to provide the taxes to the tax office? quarterly, yearly etc. In the most, I need to set aside 20% based on the calculation. However, I like to set more aside in case I end up earning more than usual or if I get penalized for late submissions. In the end, I try to put away at least 30%. Kleinunternehmer is essentially a freelancer — a specific category of a freelancer. When you apply for a tax number, you will state that you’re a freelancer. As long as you make less than 17,500 Euros a year and don’t intend to make more than 50,000 Euros the following year, you’re automatically assumed as a Kleinunternehmer. You don’t require to fill out an additional form and you don’t need to charge for VAT. When you reach above the 17,500 Euros mark, you will need to consider charging VAT, which means you need register online to obtain a VAT number (this is different from your Steuernummer). I read somewhere that in your initial year, it’s monthly reporting, but then I just a yearly report as I didn’t charge VAT. In terms of frequency, I’m not sure what’s right and what’s wrong. Currently, I have my accountant do monthly reports for VAT and yearly for income tax (but still supply receipts on a monthly basis).